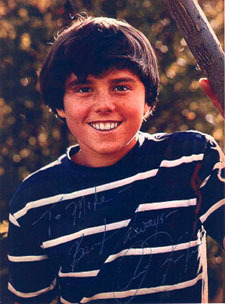 At the age of seven, Christopher Knight began auditioning for TV commercials, and eventually appeared on TV riding in a new Toyota, smiling next to a box of Tide, and pouring breakfast from a box of Cheerios. At the age of 11, he first played Peter Brady, the middle son of widowed father Robert Reed who married Florence Henderson to begin The Brady Bunch. It was Peter who brought home measles for the other kids, broke his stepmother's vase, impersonated Humphrey Bogart, and it was Peter whose voice changed just as the Brady Kids were about to record their first record. After The Brady Bunch, he joined the cast of the soap opera Another World in the mid-1980s. Since the late 1980s, Knight has worked in sales and management for a succession of high-tech ventures that have one-by-one been gobbled up by larger companies. He was a co-founder of Visual Software, now a subsidiary of the Corel Corporation, and he was involved in management at such now-dead companies as Kidwise Learningware and Hauppauge ComputerWorks. He is still working in software, and occasionally works as an actor. His first girlfriend was his Brady sister Eve Plumb, and he says they remain close friends to this day. He was the best man at Brady brother Barry Williams' wedding, and they play tennis regularly. On the Brady Bunch reunion episode of The Weakest Link in 2001, Knight won $49,000 for charity. In 2005, Knight was featured on The Surreal Life, a reality show for washed-up celebrities. The program does not have a "winner" per se, but Knight may have won that elusive career boost -- he was very much in shape on Surreal Life. By the end of the show he had also won the heart of co-star semi-supermodel Adrianne Curry, who, at 22, was 25 years younger than Knight. Knight and Curry are now living together. Knight's father was an actor who did most of his work on stage. On TV, the elder Knight could affect a vaguely menacing look, and he played at least ten different Nazis on various episodes of Hogan's Heroes. He was also in one episode of The Brady Bunch, playing the host of a TV quiz show for kids on which Cindy (Susan Olsen) competes.